Scooby Doo where are you? That’s actually a good question to ask when examining my action figure collection. You see, I own exactly 2 figures from Scooby Doo, and neither of them is the title character (or Shaggy for that matter). It’s not that I don’t like Scooby Doo, or anything. Just, for whatever reason, I never really picked up any of the figures outside of the two that I had a specific interest in owning. Today’s figure comes from my favorite episode of the original series, “Foul Play in Funland.” The episode was a bit out of the ordinary, as it featured an out of control robot named Charlie, which actually turned out to be an out of control robot, not some guy in a mask pretending to be one. The Funland Robot was released as part of the second series of Scooby Doo figures released in 2000 by Equity Marketing, Inc. He stands about 9 inches tall and features 7 points of articulation. The sculpt is fairly basic, but that’s pretty accurate to the show. I feel that the head might be a bit to long for Charlie’s design on the show, but it isn’t too terrible, especially since Charlie did have a tendency to look different from frame to frame. For the most part, Charlie is molded in the appropriate colors, with minimal paint for the gloves, boots, and then most of the paintwork appearing on the head. There’s a few questionable choices, chief among them being that Charlie seems a bit too bright for the character on the show. 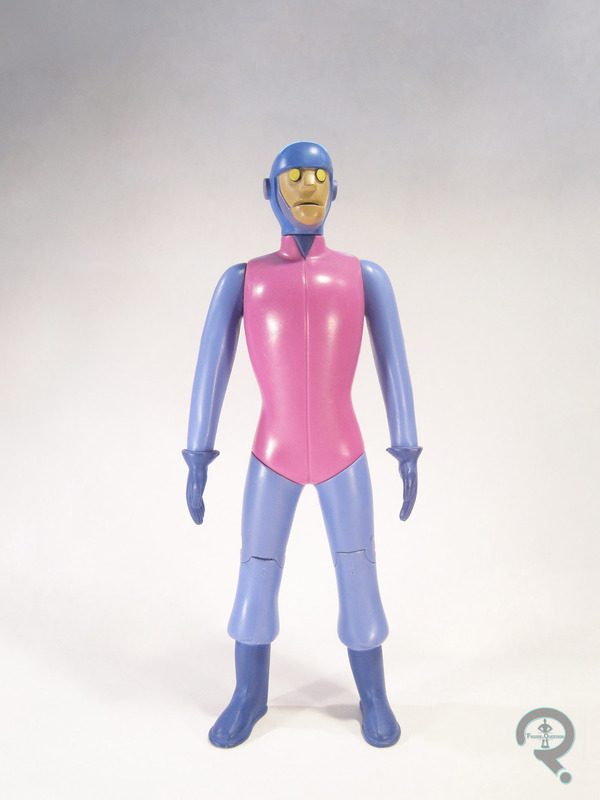 In particular, his torso being pink seems to be quite off, as it was more of a darker purple in the show. The head is overall well done, though there is an odd choice to paint most of the jaw a pale indigo color. I’m not really sure why they did that, since it should just be the same color as the rest of the face, which would have actually saved them a pass with the paint. Oh well. The Funland Robot was packed with a giant magnet that could be attached to his back, and a funhouse mirror. Charlie’s always been one of my favorite characters from the old Scooby Doo series. He’s the main point of my favorite episode, plus he’s also a robot, which is one of my favorite things, so he just added up to a whole lot of cool. When the Funland Robot was announced back in 2000, I knew I most definitely wanted one. My parents paid close attention to this, and he was amongst my birthday gifts for that year. While he may not be a perfect figure, he’s one that I really enjoy.